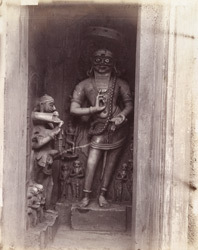 Photograph of a marble statue of Vanaraja, founder of Patan, in the Parsvanatha Temple at Patan, taken by Henry Cousens in the 1880s. The city of Patan located in Gujarat, was formerly called Anhilvada or Anhilpur and was established in 765 by Vanaraja, the first king of the Chavada dynasty. The sculpture of Vanaraja, probably dating from the 15th century, is located along the back of the shrine at the temple of Panchasara-Parsvanatha, a Jain temple which dates from the mid-8th century. In the 'Archaeological Survey of Western India, vol. IX' of 1903, Burgess and Cousens wrote, "The figure of Vanaraja, bearded and with the chhatra or royal umbrella over his head, stands 3 feet 1-1/2 inches high… The figures of the king and of his mantri or minister Jamba, who stands against the returning wall on his right, are accompanied by several attendants, who are represented, as usual with subordinates, on a much smaller scale."